ask anyone you like (within reason) as to the single most effective upgrade you can make to your bicycle and, assuming they haven't walked away, the answer will most likely be 'wheels'. if we presume that you haven't laid out the better part of £10,500 on a peter sagan replica s-works venge, then the answer is quite probably correct, with very good reason. 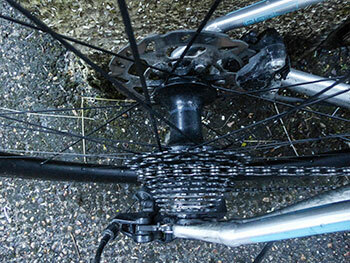 though the weight of the frame has a not insignificant influence on the bike's ride quality, particularly when riding uphill, it is, to all intents and purposes, static weight. the frame moves backwards and forwards, up and down, but its position relative to the rider and componentry remains more or less identical at all times. wheels, however, are considered as rotating weight, the reduction of which, is regarded as a good thing. lower that and you immediately lessen the effort required to accelerate to the desired speed. there are situations where lower weight offers less of a predicament, such as time-trialling, where weight translates to momentum when in motion; once up to speed, it's easier to hold that speed on a 'heavy' bike as opposed to a featherweight climbing machine. however, as a variable rule, improving the wheel quality while reducing rotating weight is a desirable target. however, at the risk of stating the obvious, a certain degree of circumspection and logic ought to govern your choice of wheels. there would not be a great deal of point in equipping one of halford's finest, with a pair of eye-wateringly expensive carbonsports lightweight all-carbon wheels. purely from a cost basis, the wheels would probably cost you anything up to ten times the cost of the bike. so who in their right mind would fit a pair of wheels with a price tag greater than that of the bicycle? though i'm being slightly devious, peter sagan, for one. in this year's criterium race at the tour down under, the former world champion elected to ride an aluminium specialized allez sprint comp disc, featuring an identical frame to that recently reviewed right here on the post. granted, mr sagan was riding a groupset a few links up the food chain from the 105 setup on my review machine, but other than that, the frame is likely the only thing peter and i will ever have in common. based purely on photographs from the australian event, it appears that sagan's ride featured a pair of specialized roval 64mm carbon wheels, hoops that retail at £100 more than the cost of the entire review model. which, in my case at least, beggars the question as to whether it makes any sense whatsoever to fit £2,000 worth of carbon wheels to a £1,900 bicycle? logically and financially, it probably doesn't make any sense at all; anyone whose budget stretches solely to the purchase of the excellent allez comp, is unlikely to have a spare two-grand sloshing about for wheels. however, the whole purpose of the exercise, other than vainly attempting to have folks mistake me for the bora-hansgrohe rider, was to find out if an alarmingly expensive pair of wheels could make a low-cost bicycle ride like like the wind. and i do hope you will take note of my use of the word, 'wind' quite so early in the review. for your £2,000 (the wheels can be purchased individually) you get a front wheel featuring 21 spokes, laced two-cross on the disc side and radially on the other and a rear wheel with a two-cross pattern on the disc side and one-cross on the drive side. 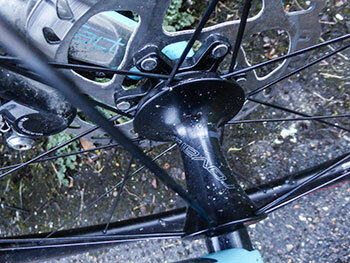 each wheel arrives with its own bag and confusingly, for wheels sporting thru-axle hubs, also a quick-release skewer. the discs, as on the original stock dt-swiss wheels that are standard fare on the allez, are fitted to splines on the hubs and held in place with lockrings. in an unexpected display of compatibility, those lockrings are removed and fitted using a standard, shimano pattern cassette lockring tool. probably the hardest thing about fitting these wheels to any bicycle is trying to remove the plastic end caps from the dt-swiss hubs. it looks as if it ought to be simplicity itself, but it really isn't. hidden within the hubs' depths are strategically placed ceramicspeed cartridge bearings to drop the rolling resistance to remarkably impressive levels. 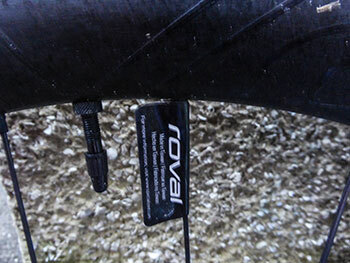 as you may have inferred from my previous reviews concerning tubeless tyres, the rovals offered no option but to be used in this fashion. though the tubeless valves are fitted at the factory, those 64mm deep rims pretty much preclude using standard clinchers with inner tubes, unless you happen to have a set of valve extenders to hand. 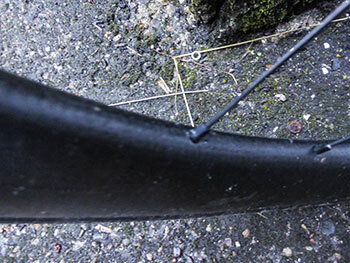 but, the velocipedinal world wants us to move to tubeless, so from a review point of view it seemed rather a long way for a shortcut to ignore that fact. 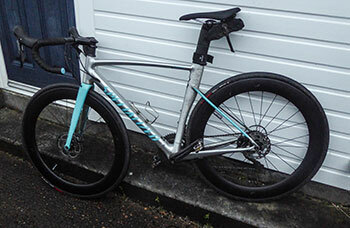 the review pair have been shod with both goodyear eagle 30mm tyres and specialized's own 28mm s-works turbos. 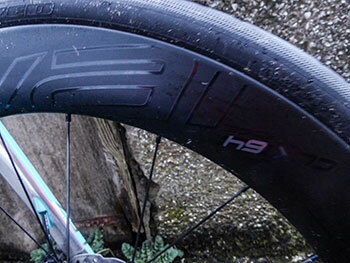 neither presented any problems when fitting to the rim, though for a more long-winded tirade against the tubeless genre, you might want to refer to my recent review of the specialized rubber. thankfully, the discs fitted to the allez's stock wheels, attach in the same manner as required by the rovals. specialized, logically, fit a 160mm rotor upfront and a smaller 140mm rotor at the rear and i cannot deny a certain difficulty in attempting to find those sizes, with a spline fitting, as aftermarket items. maybe i was just looking in the wrong place. 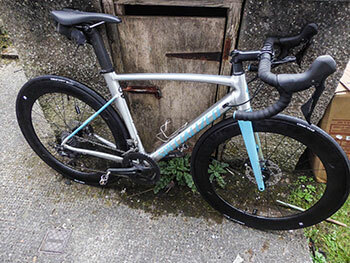 so, once fitted, did they or didn't they, transform the ride of the aluminium-framed allez comp sprint? well, from the point of view of fulfilling the purported ability of the bike (sprinting), they excelled, though i make that claim with reservations. sixty-four millimetres of carbon fibre is a not insignificant depth of rim. i live in a location particularly at the mercy of frequently strong prevailing winds. if i might illustrate this more graphically, having left the allez against the garden fence for a moment, on lifting it free to head off on my merry way, the wind lifted the entire carbon-wheeled bicycle horizontally to shoulder height. at that point, i returned the allez to the bike shed and rode off on 'normal' wheels. specialized have always been remarkably generous with the length of time allowed for the review of both bicycles and components, so i've had the pleasure of riding the rovals for a pretty decent amount of time. and throughout that period, i have yet to experience a bike ride devoid of galeforce winds. given that those deep rims act like sails under such conditions, no matter the qualities, benefits and speed offered by the rovals, they are scarcely cut out for winter, and possibly even summer, in the hebrides. my qualified acceptance of their sprinting abilities has to be tempered with having had to back off during the sunday morning sprint, when the bike was almost blown into the path of the two chaps against whom i was attempting to race. a scary moment that certainly wasn't the only one experienced. steady cross or head winds, even at galeforce, are less of a problem; getting through those is pretty much down to grunt work. hard but character-building. sudden gusts, however, often exerted a disproportionate sideways push that frequently proved a tad disconcerting. but enough of the moaning. surely £2,000 worth of rotating carbon has some sort of an upside? oh yes, indeedy. even across disturbingly dishevelled roads and cattle grids, the wheels were superb, substantially improving the ride quality of the allez. they made the most incredibly satisfying sound even at slow speeds, though i cannot deny that they handled better at higher velocities. with a highly supportive tailwind, i managed a consistent 52kph for a lot farther than i thought possible and into even galeforce direct headwinds, there was a noticeable and positive difference in speed. the problem revolved mostly around the knowledge that, at some point, that headwind would become a crosswind. still, my declared ambition is to experience an almost wind-free, yet roval assisted ride before their return; if they ride this well in adversity, there's every likelihood that i'll be signed to either bora-hansgrohe or deceuninck-quickstep next season. if competitive riding is your ultimate goal, i doubt you need me to tell you what a boon a set of rovals would be. if you're simply a more leisurely rider with a high disposable income, by all means forge ahead, but there's no doubting that, at more leisurely speeds, their marginal gains are somewhat diminished. that said, they're almost worth the price of admission simply for how much they enhance the look of the bike. i could certainly get used to that. a 64mm specialized roval carbon front wheel weighs a few grammes less than 700g and retails at a cost of £800. the rear wheel, with a shimano pattern freehub (i'm unaware of any campagnolo option) weighs 880g and retails at £1200. both come with their own wheel bags.